Most of the time we use email or USB drive to send or move files between PC and mobile phone. Now you can easily transfer your files between PC with the help of your Wi-Fi network. Today I found a new and free application called Any Send, which allows you to transfer files between your PC and mobile with a single click. To use this application on your PC or mobile you have to install the app on your device and after that you can easily share your files over your Wi-Fi network. Application is available for Windows, MAC and Android users and very soon it will be available for the iOS devices. If you are sharing your Wi-fi networks with your friend or co-workers then any send is the must have app for you to transfer files in a easy way. Now no need to use email to send files to people on your WiFi network. Just copy the file which you want to send and hit the any send button form your PC or mobile and transfer the file. So lets take a look how the application works in Windows, MAC and Android mobile. To get started all you have to download and install the application on your Windows, MAC or Android. You can find the download link at the end of this post. We tested this application on our Windows, MAC and Android phone and the application works like a charm without any problems. Once the application is installed on your PC or mobile you are ready to share the files. Now all you hvae to select the file which you want to transfer to your other device, just copy the file or hit the Control + C button to copy these files on your clipboard. 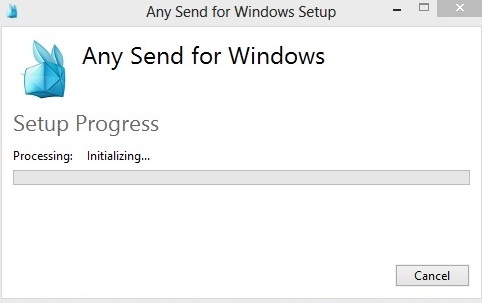 Now on the task-bar of your windows desktop you can see the Any Send App icon. 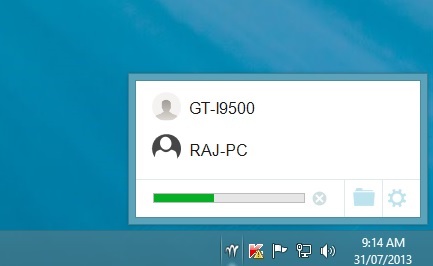 Click on the icon and select the other device name in which you want to transfer the file. Remember you can only send the files to those device and PC which has the Any send application installed. Not only you can transfer the files with the help of this application, but also transfer entire folders or zip folder from one computer to another. Just copy the entire folder and hit the Any send icon form the task-bar to select the device and transfer the entire folder. To use this application all your PC and android mobile should be connected to the same Wi-Fi network and the application is installed on the each PC and Android Mobile. One of the free and easy to use application to transfer files between your computers. Looking for more free application, check out our Download Section here!